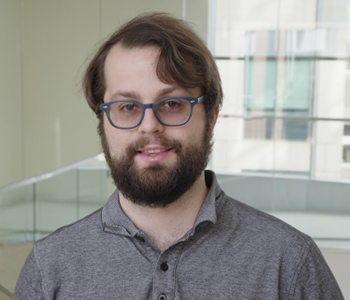 Cameron Myhrvold is a postdoctoral fellow in the Sabeti Lab. He is interested in developing Cas13-based technologies for viral detection and destruction. In 2016, Cameron completed a PhD in Systems Biology PhD at Harvard University. At Harvard, Cameron was jointly advised by Pamela Silver and Peng Yin. He worked at the interface of synthetic biology and nucleic acid nanotechnology, and organized proteins inside of living cells using programmable scaffolds. He also used synthetic structures for applications such as counting cell divisions. In 2011, Cameron received an A.B. from Princeton University, majoring in molecular biology with a certificate in quantitative and computational biology. At Princeton, Cameron studied the evolution of quorum sensing under Bonnie Bassler. Cameron was awarded a Fannie and John Hertz Foundation Fellowship in 2011 to support his graduate studies. Cameron was named one of Forbes’ 30 Under 30 for 2019. Field-deployable viral diagnostics using CRISPR-Cas 13. Myhrvold C, Freije CA*, Gootenberg JS, Abudayyeh OO, Metsky HC, Durbin AF, Kellner MJ, Tan AL, Paul LM, Parham LA, Garcia kF, Barnes KG, Chak B, Mondini A, Nogueira ML, Isern S, Michal SF, Lorenzana I, Yozwiak NL, MacInnis BL, Bosch I, Gehrke L, Zhang F, and Sabeti PC. Barcode Extension for Analysis and Reconstruction of Structures. Myhrvold C, Baym M, Hanikel N, Ong L, Gootenberg J, and Yin P.
Synthetic Lipid-Containing Scaffolds Enhance Indigo Production by Colocalizing Enzymes. Myhrvold C*, Polka J*, and Silver PA.
A Distributed Cell Division Counter Reveals Growth Dynamics in the Mammalian Gut. Myhrvold C, Kotula JW, Hicks WM, Conway NJ, and Silver PA. Using synthetic RNAs as scaffolds and regulators. Nat. Struct. Mol. Biol. 2015. Myhrvold C and Silver PA.
Isothermal self-assembly of complex DNA structures under diverse and biocompatible conditions. Myhrvold C, Dai M, Silver PA, and Yin P.